Pizza may be the perfect food. It is simple yet complex, it is common and gourmet, and Americans eat 350 slices of it every second. With honesty, integrity, simplicity, and humor, What Every Child Needs To Know About Pizza explains this amazing food to young children, helping them to understand the modern world and, more importantly, the adults in their lives. 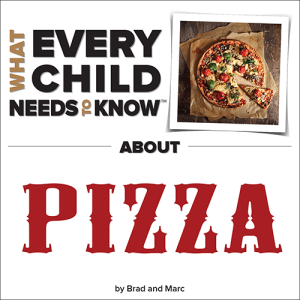 Written by two dads—a child expert and a researcher—What Every Child Needs To Know About Pizza is the book for any adult who wants to help young children foster an appreciation for this humble and profound dish.